"No matter how badly I feel like giving up, I push myself to face every challenge head-on. Even now, I constantly face hurdles. Sometimes I don't feel as confident as I want to be or I'll receive a negative comment on the internet about my work. Not everyday is easy. It's important to focus on the positives, though, and make the best of every day", says Sanah Jivani, a 17 year-old beautiful social entrepreneur and a change maker. 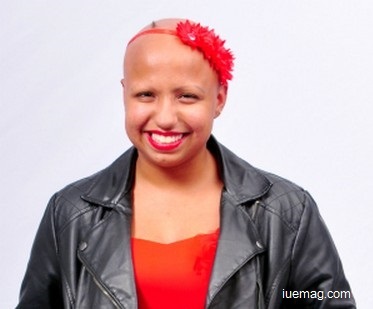 She is the founder of a growing non-profit organization Called Love your Natural Self Foundation, Founder of The International Natural day, Former Print Editor in Chief at KC Legacy Media, Avid public speaker, President of Interact Club, and one of the few people living with severe Alopecia. Jivani was diagnosed with Alopecia Areata at the age of three. For many years, her hair loss was minimal, but in seventh grade, Jivani’s life changed forever. She says “I woke up one morning and almost all of my hair was on my pillow”, Jivani said. “It was terrifying. It’s like all of a sudden, all of the problems that you have seems to not matter so much anymore. It’s this big life-changing event. I didn’t really know how to come back from that, or how to react to it." YES!! Alopecia Areata is a type of autoimmune disease where in, our white blood cells considers our hair as a foreign object and fights back till they are out of the body! Jivani started wearing a wig to school, but many of her classmates could tell. Some bullied her, calling her “fake” and claiming she was just trying to get attention. This went to an extent that one day she found a note titled "50 ways to go kill yourself" in her locker. Her confidence dropped, and so did her attendance. After receiving a letter about her absences saying she might have to repeat the eighth grade, she decided to alter her outlook. She decided to take the more positive route and become the person she was born to be. She made the decision to go without her wig. It was the scariest thing she could have ever done, but doing it gave her so much perspective. It taught her that the whole world doesn’t revolve around looks alone. Now, Jivani helps others realize their own beauty and self-worth through her nonprofit: the Love Your Natural Self Foundation in 28 Different Countries. She says, "It takes one moment to make a life-changing decision, and people often try to avoid that moment. They distract themselves with other things instead of using life's moments to take risks. Natural Day would be special because it would force everyone to take a moment to look back and let go of the one thing that holds them back". Natural Day is the biggest project of Love Your Natural Self Foundation, Its Celebrated on 13th of February every Year. It’s the day before Valentine’s Day because you have to love yourself before you can love anybody else. On Natural Day, no one wakes up early to do their make-up or style their hair. It’s a day where you are purely you. The Love Your Natural Self Foundation offers programs including empowerment sessions; a curriculum for middle and elementary school children focusing on the elements of hope; and exhibition booths to spread awareness about the cause. By overcoming the adversity brought on by Alopecia, Jivani has become an inspiration and a hope for others suffering from a low self-image. 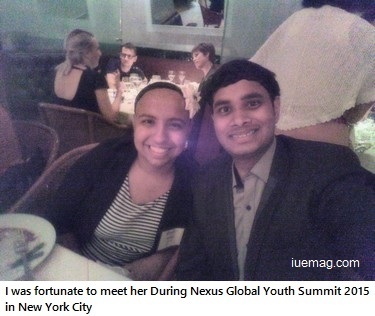 I was fortunate to meet her During Nexus Global Youth Summit 2015 in New York City, where I asked her to share a message to the youth. She said, "Believe in yourself and believe in your passion. I never thought I could start a successful non-profit at the age of 17, but I believed in the idea so much and now it has come so far. It's all about working hard and knowing in your heart that anything is possible." Any facts, figures or references stated here are made by the author & don't reflect the endorsement of iU at all times unless otherwise drafted by official staff at iU. This article was first published here on 4th August 2015.